A week in Cornwall coincided with a 13th wedding anniversary for me and Mrs. SF (Mrs. SF said it feels more like 130 years – that is a good thing right?!). 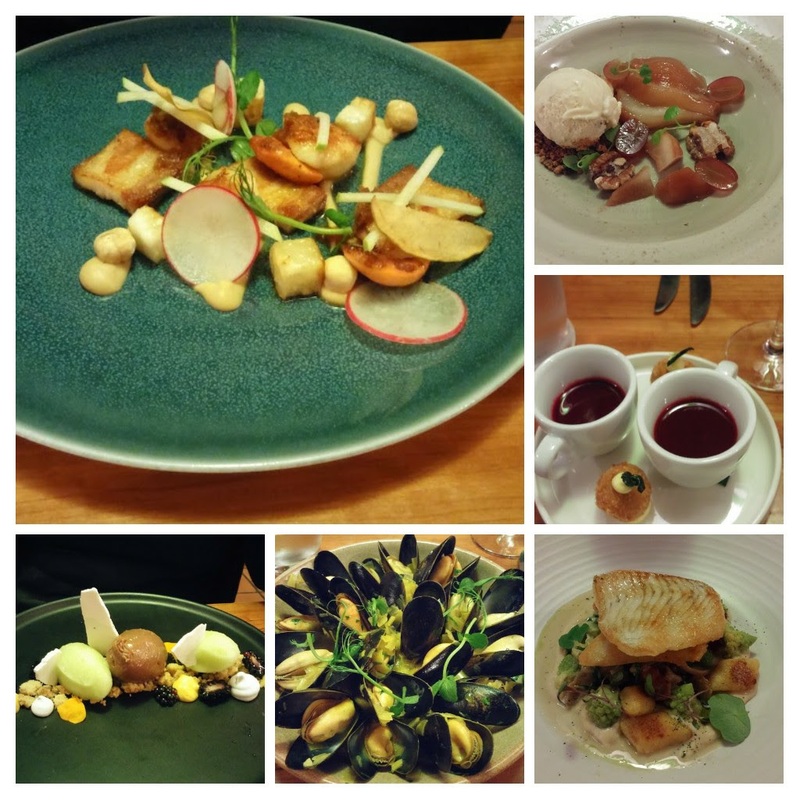 We always tend to go out for dinner on our anniversary (me to toast my good fortune at punching well above my weight and Mrs. SF to reflect on her seemingly appalling taste in men whilst tucking in to a plate(s) of good tasting food). We are usually away somewhere in Europe on the date in question (Budapest last year – highly recommended), but decided this year to stay in the UK so we could take the doggies with us. 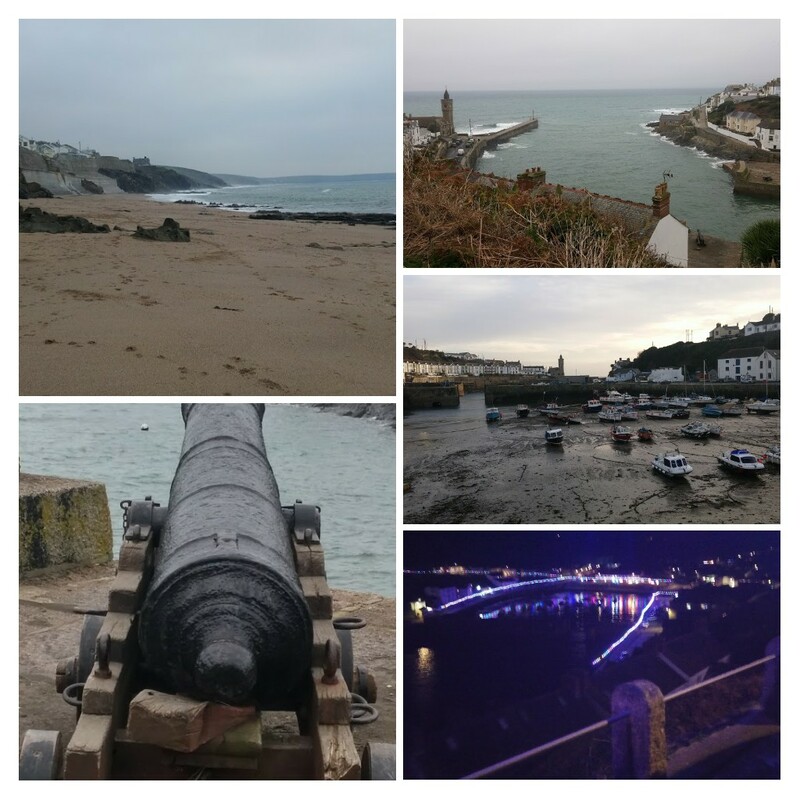 Our destination was the lovely Southern Cornish village of Porthleven (mainland UK’s Southern most working fishing port). A veritable foodie paradise, with a plethora of places to eat out of all proportion to its size (just over 4,000 – people rather than restaurants that is), a large number of which are doggie friendly – a real bonus for us as dog owners (more on that in another post to come – if I get around to writing it up). 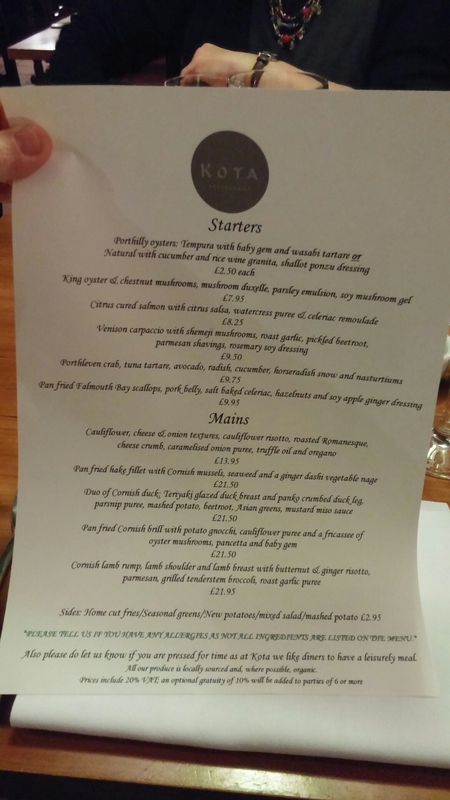 For our anniversary meal our choice was Kota (not doggy friendly), whose chef patron is Jude Kereama – a regular on the Great British Menu ( having battled it out this year with Josh Eggleton of the Pony and Trap and Chris Wheeler of Humphry’s). On previous visits to Porthleven we have always eaten there and enjoyed the food and saw no reason to choose Rick Stein’s new gaff in Porthleven (which gets somewhat mixed reviews – Porthleven seems to have accepted the Stein juggernaut with the merest shrug of the shoulders and as yet there is no question of it turning into LevenStein/PorthStein) over Kota for our anniversary meal. Situated directly on the harbour head there is a lovely ozone aroma in the air as you walk to the place. although the tiled floor does (to my mind at least) make it feel a tad cool (as in chilly rather than trendy). Great in the summer, less so on a cold winter’s night. 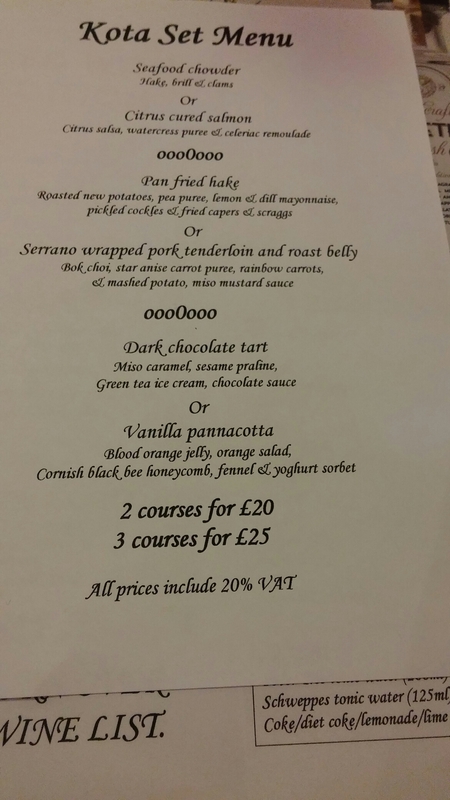 For those looking for something a bit cheaper they have a nicely priced set menu. Whilst tempted by the non seafood dishes (all of which sounded lovely) when you are (for a one off visit rather than being a regular) in a restaurant this close to the sea (in a working fishing port) it would (to me) be foolish to not partake of the bounty of the sea. Like going Naples and saying “Let’s skip the pizza”. As we perused the menu, we had a rather fine G&T utilising Cornish gin. 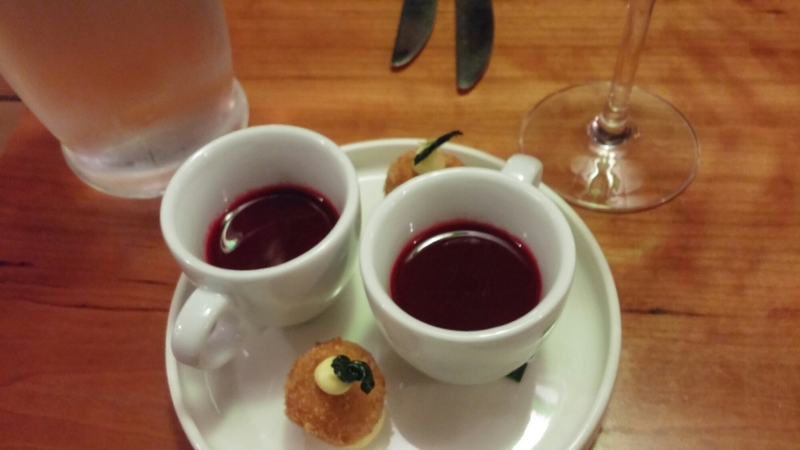 Once we had made our choices, a lovely amuse bouche arrived in the form of a soupçon of an earthy borscht type affair and a smoked haddock fish cake (topped with a lovely bit of crispy kale). A great start to the meal and a good portent as to the quality of what was to come. 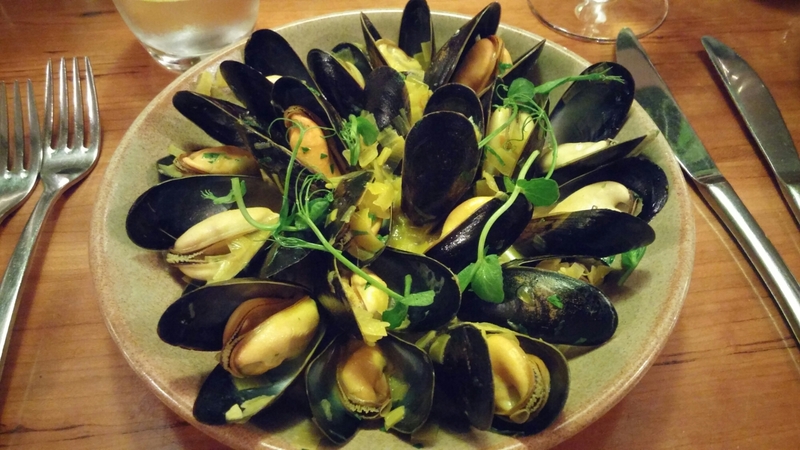 For my starter, I went for the special – mussels in a cider cream sauce (£7.95). Beautifully plumb bivalves, with a velvety cream sauce containing just the right amount of cider flavour in the sauce to cut the richness of the cream. No clever foams here, just really good, precise cooking that let the top quality ingredients do all the talking. 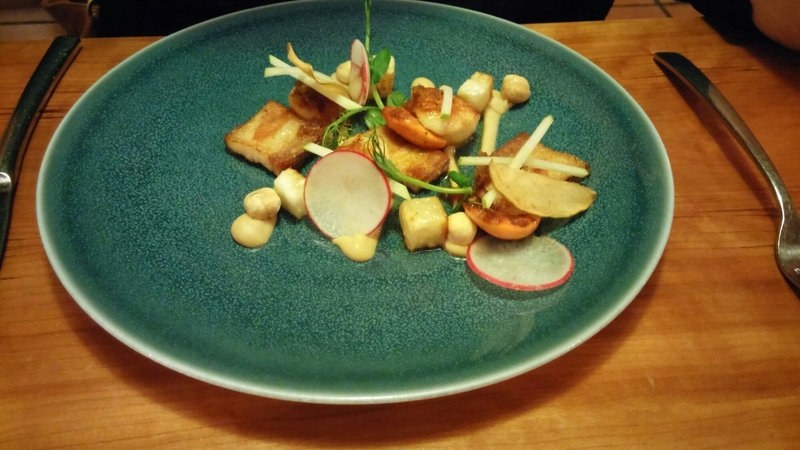 Mrs. SF’s scallop dish (£9.95) was a more elaborate construct and as pretty as a picture. No question, however, of style over substance here as it did not disappoint on the flavour front. Perfectly cooked scallops, with that combo made in heaven of pork (here, just the right side of crispy, belly), were complimented by salt baked celeriac and an inspired addition of hazelnuts. The nuttiness of the later working really well with the sweetness of the scallops and the richness of the pork belly. All was set off to a tee by a lovely soy ginger apple dressing and some crisp, refreshing, radish slices. 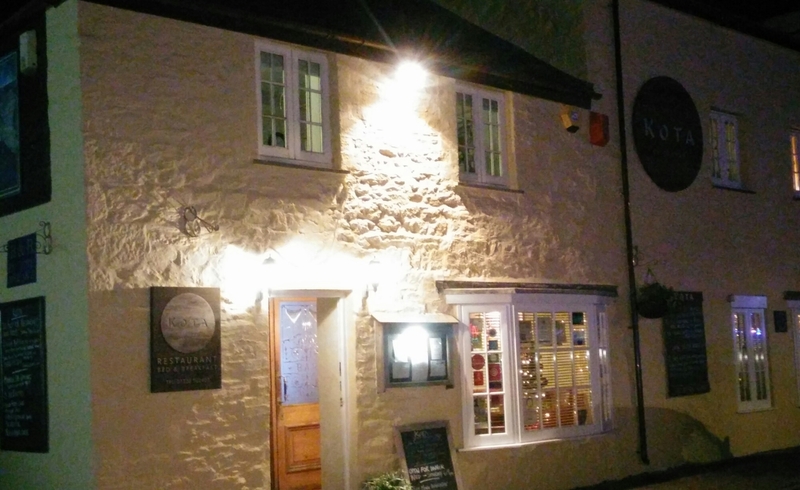 Next up, as the post title suggests, was a brilliant fish dish utilizing brill (£21.50 – which both Mrs.SJ and I went for). 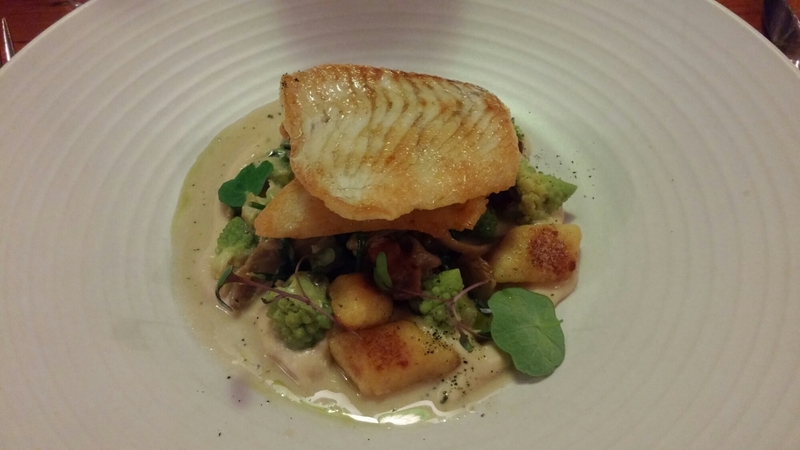 Brill is (in my experience) a rare fish to find on a UK restaurant menu. In the same family as the king of fish, the turbot, brill is its unsung baby brother and bang in season on our December visit. Here it was cooked to perfection – beautiful moist flavoursome flesh, sitting on pillows of melt in the mouth gnocchi, romenesco (cooked so it retained a nice crunch) and a fricasee of oyster mushrooms, pancetta and baby gem lettuce. Bringing it altogether was a stunning sauce that made me want to lick the plate clean (I did use my finger until Mrs. SF gave me the look – which means do that again and you won’t make it to a 14th anniversary). A superb bit of cooking this. 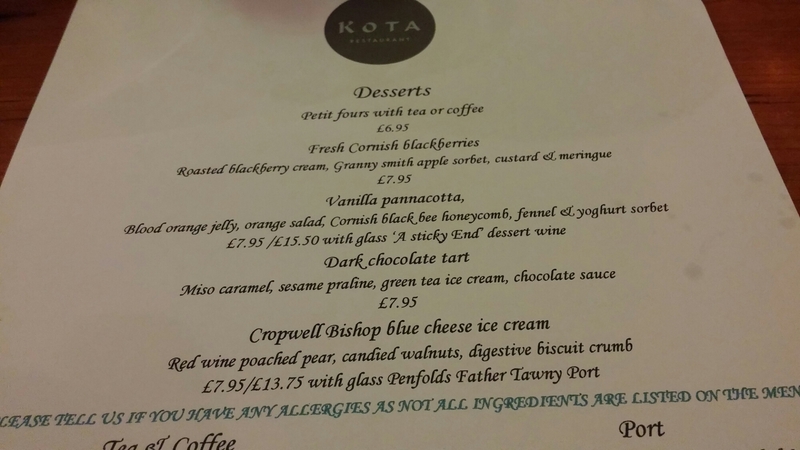 I went for the intriguing sounding Cropwell Bishop blue cheese ice cream (£7.95 or £13.75 if you add the suggested sweet wine pairing, which of course I did). 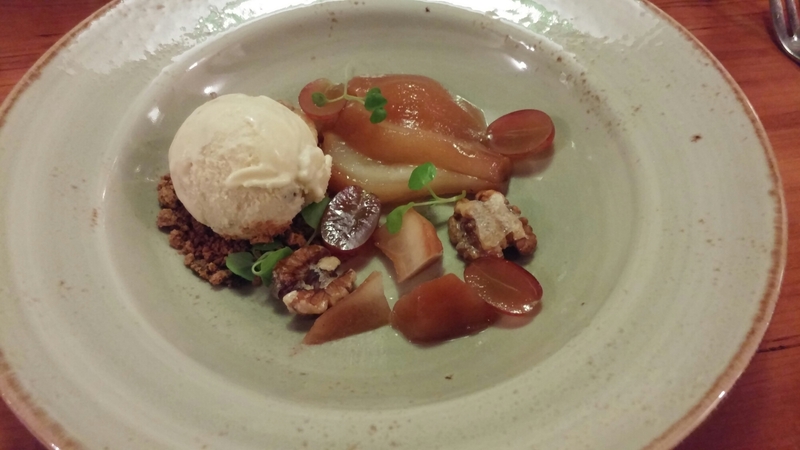 The blue cheese in the ice cream was quite subtle (thankfully) adding a nice tangy saltiness to the dish. It worked very well with the red wine poached pears (always a good combo blue cheese and pears) and the sweet nuttiness of the candied walnuts. Grapes added a touch of sharp to the equation. A classic accompaniment (cracker wise) for blue cheese is a digestive biscuit and the digestive crumb here worked very well as part of this dish. Really clever cooking here, with a lovely marriage of salt and sweet and just a drop of sharpness. Mrs. SF went for the”Fresh Cornish blackberries”, being a sucker for a blackberry (are blackberries still in season in December – even in Cornwall?). 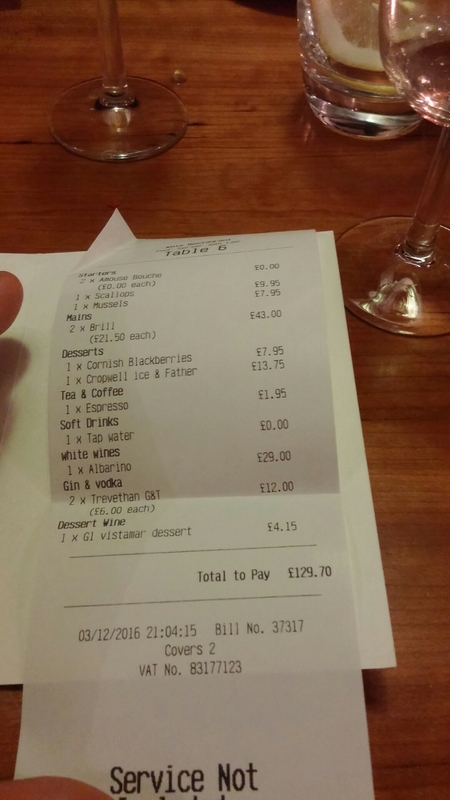 This in reality was a sort of deconstructed blackberry and apple crumble. I am not a huge fan of deconstruction as I generally think if it ain’t broke don’t fix it. 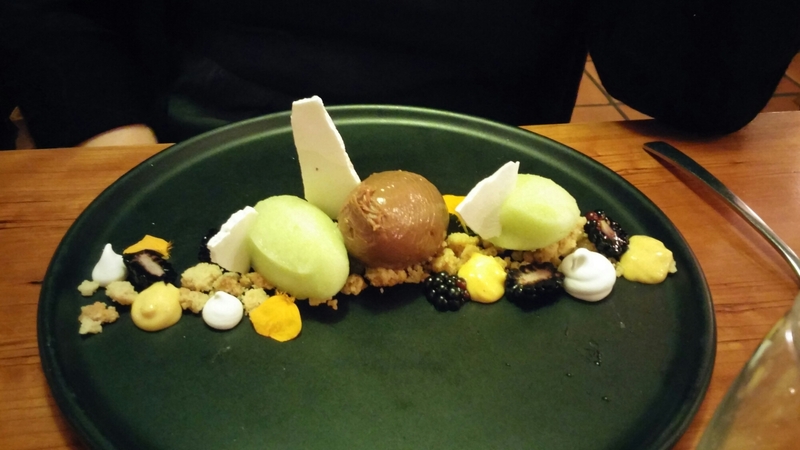 The blackberry cream was very nice, but Mrs. SF said the apple sorbet (very nicely sharp from the taste I was given) somewhat overpowered the blackberry element. The custard and crumb were nice touches, but neither Mrs.SF nor I were clear where the meringue fitted in. Individually all the element were very pleasant, but Mrs. SF felt it as a whole it was less than the sum of its parts with it not quite delivering on the expected showcasing of the blackberry. 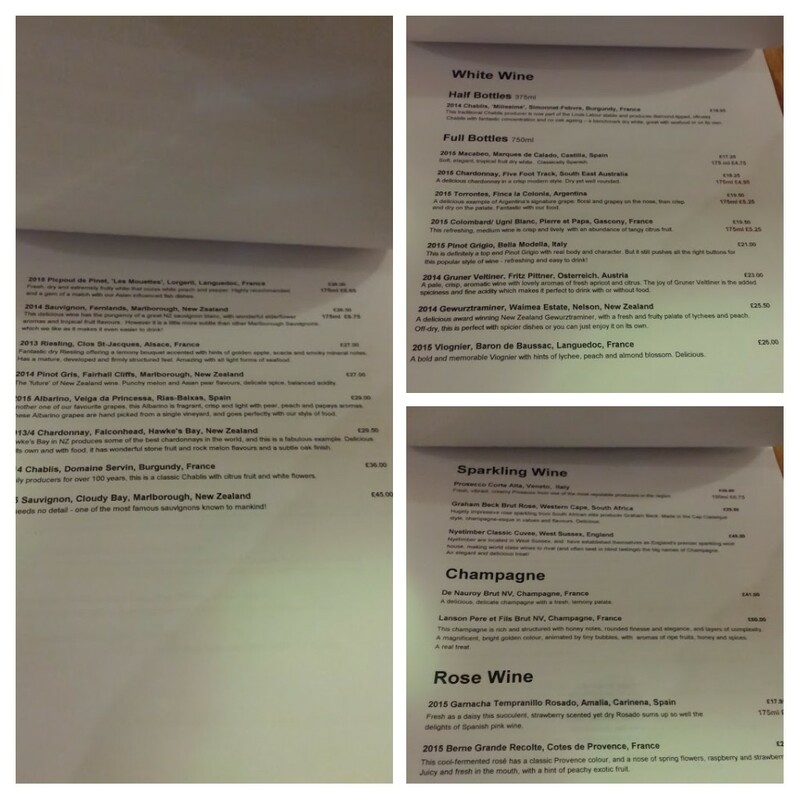 Prices range from £17.25 to £50 (so nothing ridiculously expensive) and a bit of thought has gone into the list. Nice to see pinot noirs not just from France and New Zealand, but also from Alto Adige in Northern Italy. On the whites, the list caters nicely for the Asian flavours that the chef often brings into play and includes a riesling, gruner veltiner, pinot gris, gewurztraminar and a voignier. 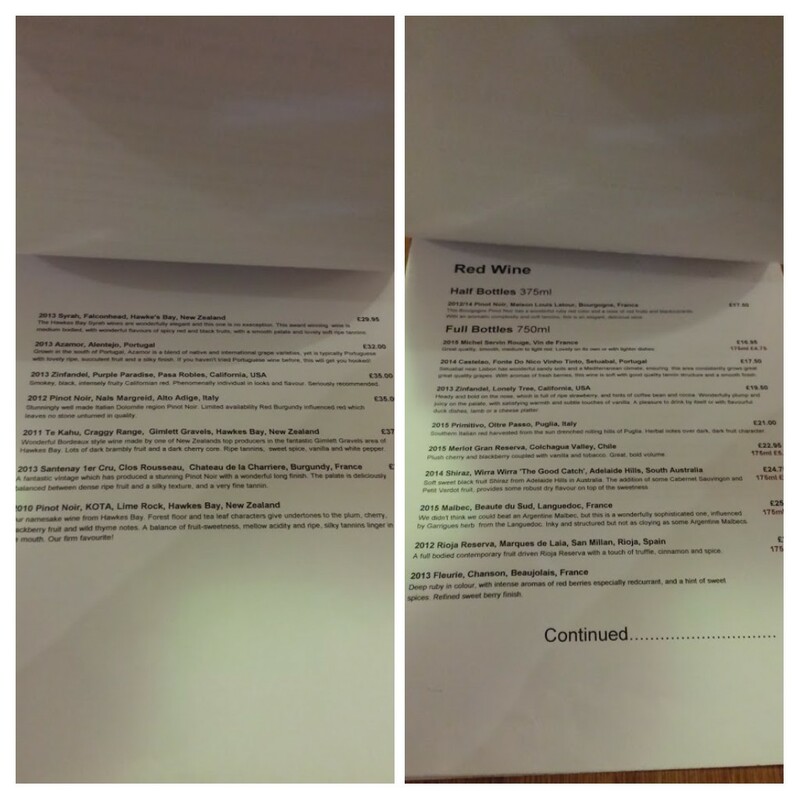 Based on our choice of starters and main course, I was torn between the gruner, riesling and albarino on the list. 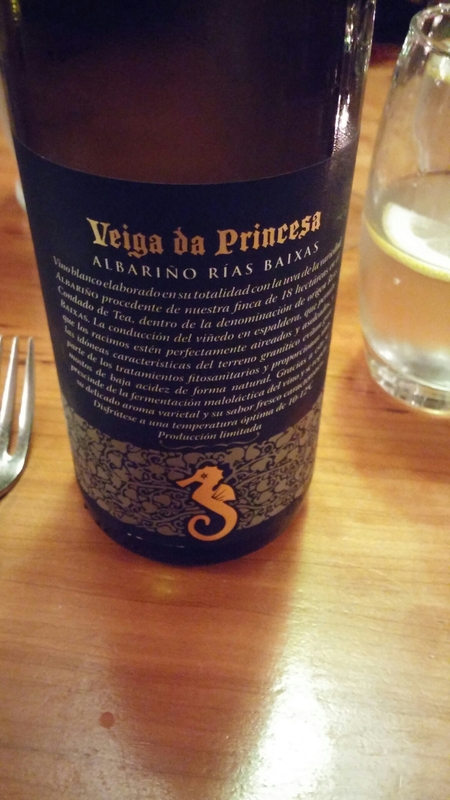 I decided, based on my mussels and the lack of Asian influences in the brill dish that, that seafood wine per excellence, albarino was the one for me in the form of a Vega da Princesa (£29 – around £14 retail in UK so a fair mark up). This was lovely with my mussels and the brill, with peach, citrus and a nice slake of minerality. I went for the Penfold’s Father Grand Tawny (£6.95 on its own) which I found a bit thin and a touch medicinal for my taste. Not a patch, in my opinion, on a decent proper tawny port. I note it is referred to as port on the list, but I am pretty sure it can’t be called port due to EU PDO rules. 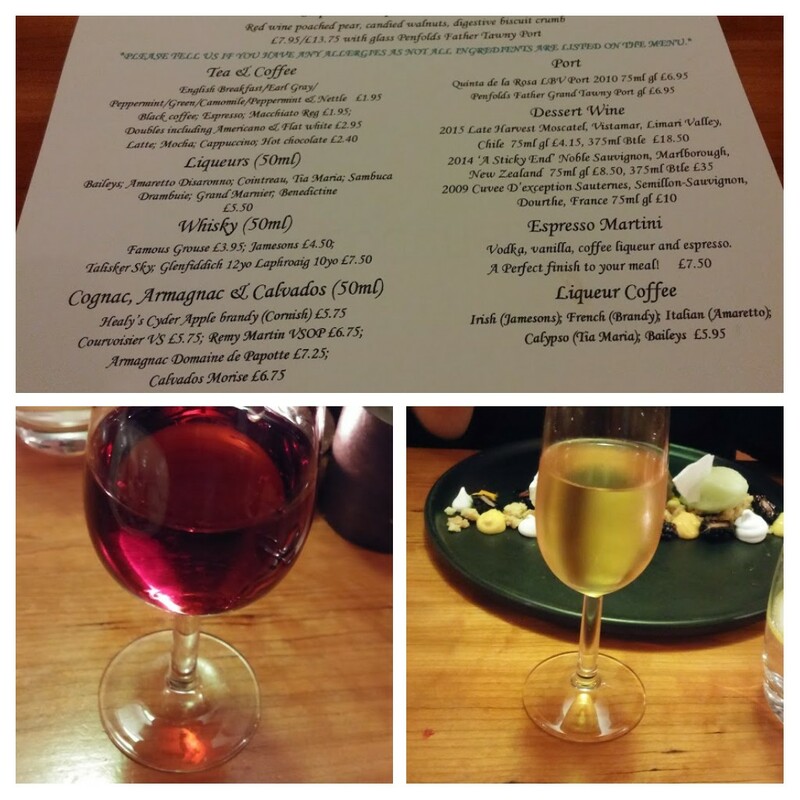 Mrs. SF had a glass of Chilean late harvest moscatel (£4.15), which worked very well with her dessert. For non wine drinks they have a selection of cocktails, spirits and beers (all with at least a nod to Cornish products) and it is always nice to see a decent selection of soft drinks for the designated drivers. The only real omission from the list is some sherries. Given sherry (in its various guises) is a great food wine, with finos and manzanillas pairing brilliantly with fish, this was surprising. Not cheap, but I thought for what we had it was very good value. Would I go back? Definitely – the Rich Stein empire may have arrived in Porthleven, but to me Kota remains the go to restaurant in the area. Winter opening hours: Wed – Sat :6pm – 9pm. 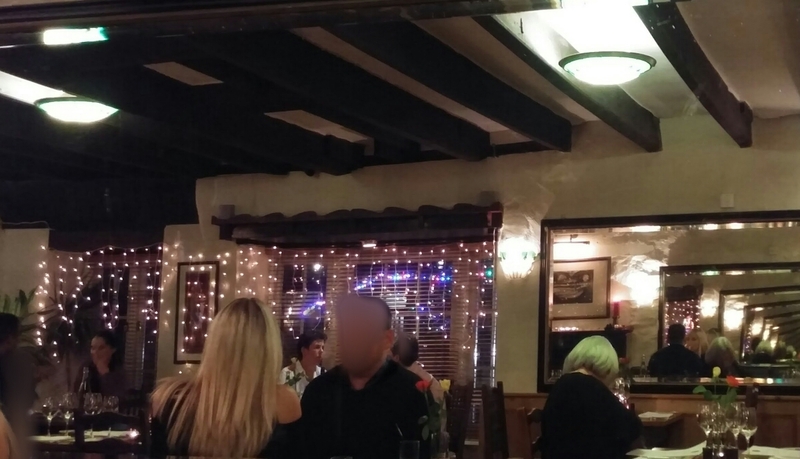 They also have rooms above the restaurant. 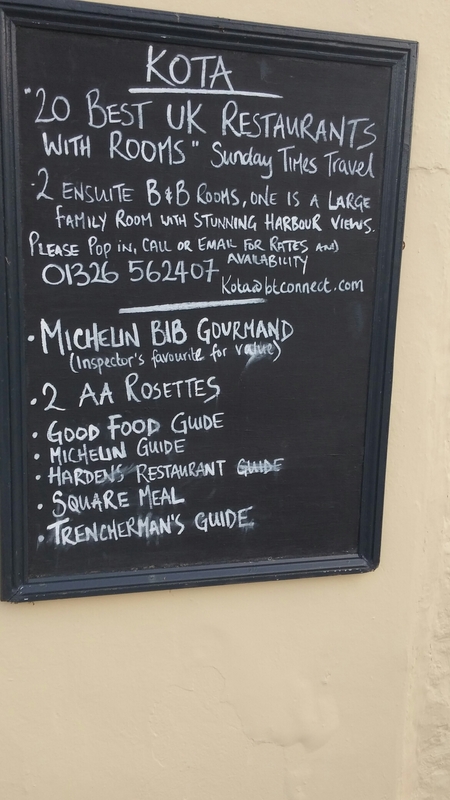 Ideal for a foodie weekend break. If you are looking for less formality Kota’s sister establishment, Kota Kia, gets lots of plaudits. My sister raved about it when she visited earlier this year. 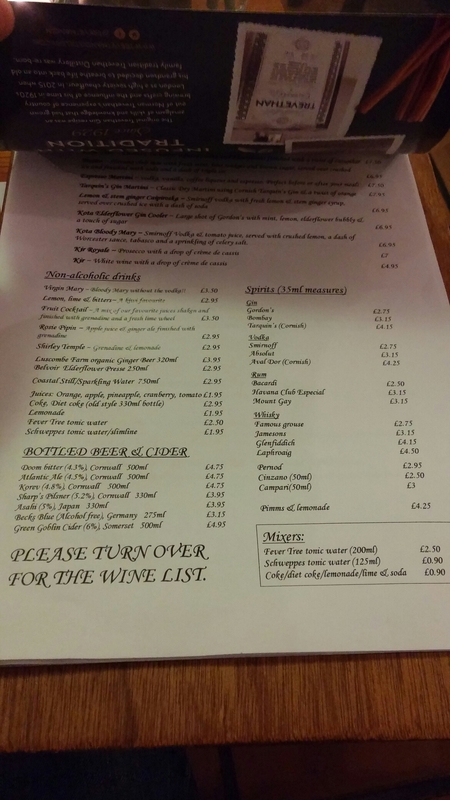 This entry was posted on Dec 11, 2016 by solicitingflavours in albarino, Alcoholic drink, Alternatives to sauvignon blanc, Australian wine, Austrian Wine, Cornwall, desserts, Drink, Dry white wine, early bird menu, Fine dining, fish, Fixed Price Menu, Food, Food and wine products, French wine, Galcian white wine, Ice cream, Italian wine, Kota, Moules, Mussels, New Zealand wine, Outside Wales, Picpoul de pinet, Pinot Noir, Pork, Port, Porthleven, Red Wine, Restaurant Review, review, Riesling, seafood, Spanish wine, sweet wine, Travel, Uncategorized, White wine, wine, wine mark up.